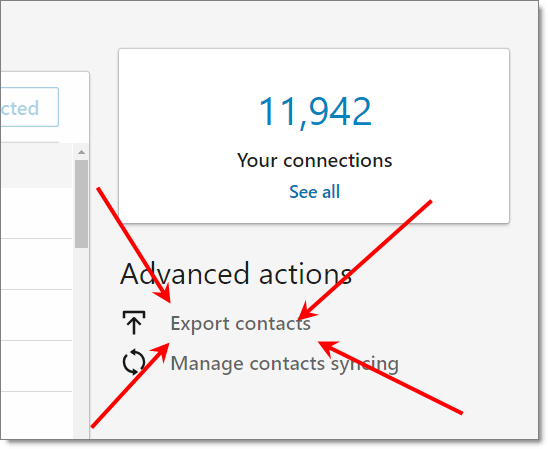 One of the frequently asked questions we get at JibberJobber is how to import contacts from Outlook and LinkedIn (and Gmail). In this post I’m going to focus on just LinkedIn. However, the three steps are pretty much the same for any system that exports to a .csv file. (you can even create your own .csv file and just skip to Step THREE). 2. On the left, click the number of your contacts, which takes you to your contact list. 5. 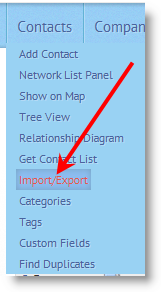 In the next dialog, click on Imported Contacts and Connections, and then follow the steps to export those. You can also click on Me (your account dropdown on the top menu), Settings and Privacy, then scroll down to Download your data. That takes you to step 5. 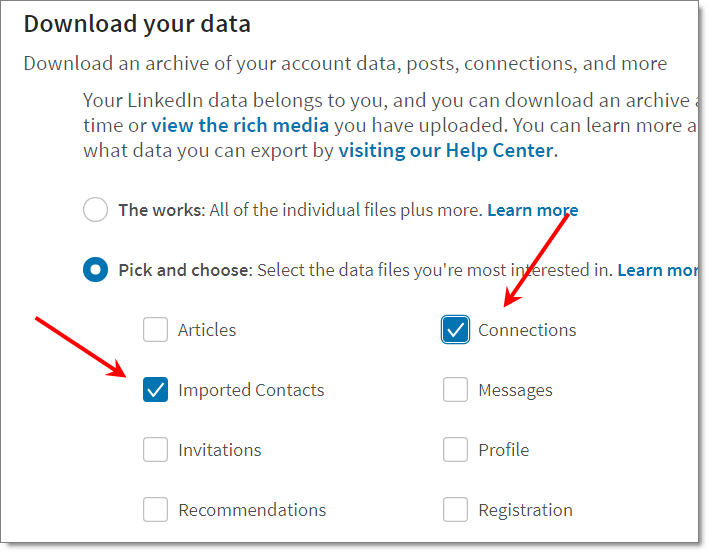 That’s it – it is really that easy to export your contacts from LinkedIn! The hardest part of this is knowing where your file was saved to… but you should know how to find it. I delete all of the columns with blank data. The last time I checked there are FIFTY FIVE(!) columns that had a header but no data… delete all of these empty columns. I go through the first and last names and clean them up. I take out things like middle initial, acronyms, email addresses (from the name fields), etc. I simply want a first and last name. This is the most time-consuming part of the process. Now you have a clean file so no “garbage in, garbage out”! Note: Importing into JibberJobber is a premium feature. You can upgrade here. 2. 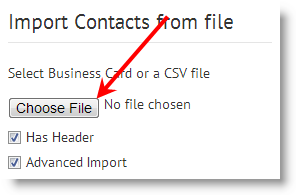 The default option you see on the Import page is to import contacts. Click Choose File and browse to (and select/”save” or “open”)your CSV file. 4. Look at the rows and columns. Anything that is WHITE will import. If a row is colored yellow(ish), we think it is a duplicate, and we won’t import it. (you can override this by clicking the checkbox to the left of that record, and we’ll import it). If a column is colored, it is NOT MAPPED and we won’t import it. You can click the drop down on that column and choose a field to import it into (aka, map it to the right field). In this image you can see that we think the first record is already in the system, so we are not going to import it. It is yellow(ish). Hard to see, but on the left the checkbox is also unchecked. All of the columns are mapped, which we can tell because they are not colored yellow(ish). 5. Scroll down to the bottom and click the import button. After the import you will get a confirmation message right under the main menu with the number of records imported. Right now we try to not import duplicates. In the future we plan on merging duplicate records (in case there are title changes, etc.). Feedback? Questions? If you need technical help, use the Contact form and we’ll get back to as soon as we can. I followed the instructions but the CVS export only contained the job title and email address – everything else was blank including first / last name. Can this be correct? I just tested it on LinkedIn and you are right – they must have a bug right now that is not exporting the first and last names. I did get an email address, company and title. 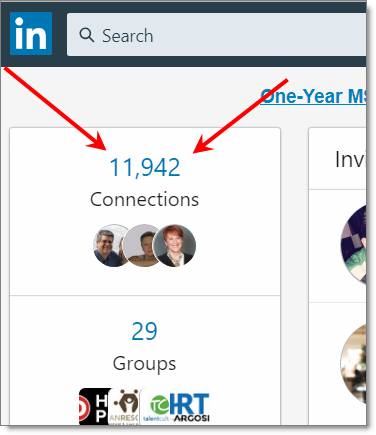 The next step would be to contact LinkedIn and let them know… I’m guessing this will be fixed in the next day or two, unless no one reports it. 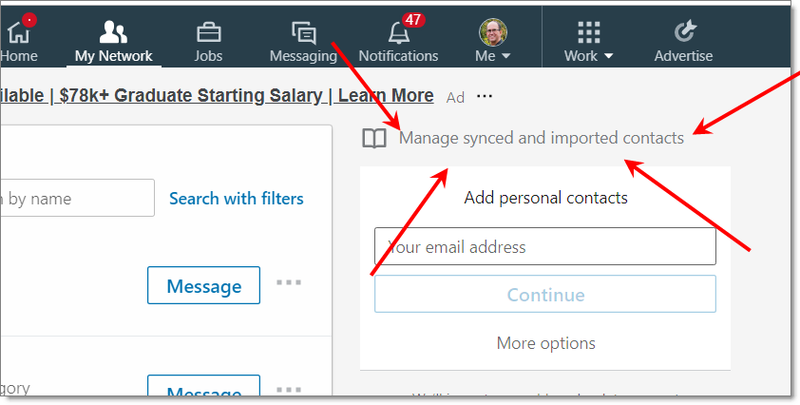 Related to what you get (but not this particular new bug): in this blog post I talk about how LinkedIn has 55 field in the export but most are blank.